The DRC government launched a sensitisation campaign on 1 January 2008, aimed at the disarmament of all remaining armed groups, both national and foreign, in North and South Kivu provinces in eastern DRC. MONUC's DDRRR and DDR divisions are assisting in the campaign, and much will depend on the upcoming Kivus' peace conference which begins in Goma on Sunday 6 January next. The declaration was made before the holding of the Kivus peace, security and development conference in Goma, envisaged for 6 January next, and follows on from the agreement signed in Nairobi on 9 November last between the DRC and Rwanda. For the remaining foreign combatants in the Kivu provinces, MONUC’s Disarmament Demobilisation, Repatriation, Resettlement and Reintegration (DDRRR) division will assist the DRC government with the sensitization of combatants through the use of radio broadcasts and leaflets encouraging them to surrender and return home. Mr. Ndiaga Diagne, a MONUC DDRRR officer based in Goma said that MONUC had 18 mobile radio teams on the ground in both provinces, who have a broad knowledge of the foreign combatants and their location. “Our role is to support the DRC government with all the means and expertise at our disposal. We are ready to assist contacts between the DRC government representatives and the FDLR on the ground, in order to have the most complete sensitisation possible,” he explained. “There are approximately 8,000 foreign combatants remaining in the Kivu provinces, 6,000 in North Kivu and 2,000 in South Kivu. The majority of foreign combatants in the Kivus are FDLR combatants from Rwanda,” he added. The campaign is also aimed at Congolese armed combatants in the Kivus and the respective Disarmament Demobilisation and Reintegration (DDR) programme. The majority of combatants in this regard are ex General Laurent Nkunda’s rebels, as well as Mai Mai factions. Much yet depends on the outcome of the Kivus peace conference in Goma, where many of the issues relating to peace and security, including the issue of armed groups, will be discussed. In 2007, MONUC in collaboration with UN agencies and other Congolese and international partners continued their joint efforts for reaching full Disarmament, Demobilisation and Reintegration (DDR) of all illegal armed groups in the DRC in accordance with MONUC’s mandate. 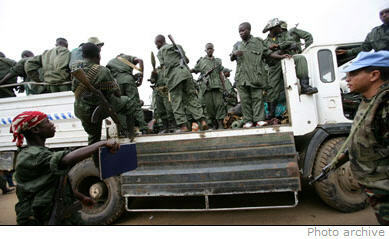 Despite many difficulties, approximately 13,851 Congolese combatants were disarmed in 2007. Furthermore, MONUC’s DDRRR division assisted in the repatriation of 800 foreign combatants and 629 of their dependants from the DRC in 2007.